"...a masterful presentation of grammara well-structured, incremental course in diagramming with clear explanations and memorable illustrations of each new principle... Phyllis Davenport understands that if you want to make yourself understood, you need grammar. 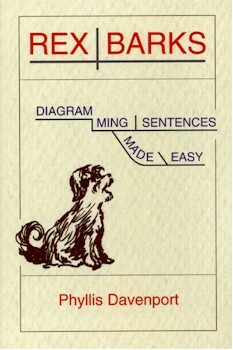 Her textbook abounds with examples of the ambiguities that result from an ignorance of grammatical rules...The art of diagramming sentences provides students with an indispensable foundation for the study of grammar, and Rex Barks makes the process of learning this skill manageable and fun. The book is laid out in logical, incremental steps, and students are given the opportunity to master one concept before proceeding to the next...It contains many clever devices to help students with tricky concepts (e.g., prepositions are to be remembered as "anything a squirrel can do to a tree.") And it is pervaded by her sense of humor and enthusiasm for her subject. where as part of the set it is available at a substantial discount.